Submitted by maki on 2013-03-05 22:03. Very cool! I have been waiting to learn how to make this stuff for a long time. I am so glad you have the directions step by step for our understanding. Thank you so much! Thank you this is a great explanation of dash. Wish I were still in Tokyo where these ingredients are so much easier to find. Looking forward to this cooking series. one question! if I leave the katsuobushi longer in the stock, will the dashi produce stronger flavor? It will get stronger in flavor to some extent but never *too* flavored or anything. The only way to make a dashi really strong in flavor with katsuobushi is to just stuff the water with as much katsuobushi as will fit. On the original Iron Chef program in Japan, one of the Japanese Iron Chefs used to do that by putting in like 4 handfuls or so of katsuobushi in a small pan of water. Thank you! I've already made some, and it tasted VERY good, even though I don't think the quality of the konbu that I bought here was any good. It didn't have much of the "white stuff" on the surface. But the dashi still turned out great! Yep, Michiba-san is my all time favorite Iron Chef! 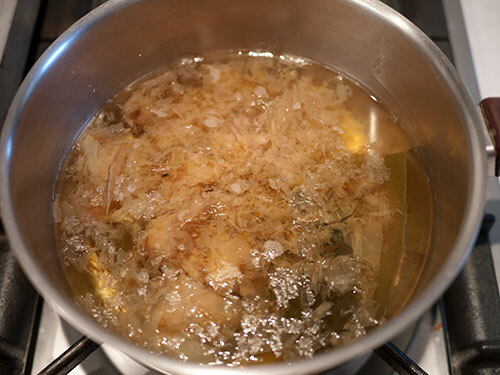 After reading this blog entry and your replies, I've discovered this: Putting more katsuobushi, instead of cooking longer time, would add more flavor to the dashi . However, simmering konbu for a longer time (30mins) would add more flavor to the dashi. Am I right, Maki? You've got it Chiaoli! Some people like a strong katsuobushi flavor, while others don't, so it's up to each cook to find out the best balance for his/her tastes. I personally do not like a very strong katsuobushi flavor, so I do the kombu-simmering part but don't overload the pot with katsuobushi. I think this Washoku 101 is just fantastic! Having cooked basic Japanese dishes for some time now, I've made dashi from scratch before but I'm still learning a lot about different views on what is the 'proper' way of doing it. For instance, I've been told to remove (after soaking for 30 mins) the kombu before the water reaches boiling, then add katsuobushi and bring to a boil for several minutes. And it's not just dashi; basically anything Japanese has ten accepted ways of making, so I'm working hard to try to find the ones I prefer myself. 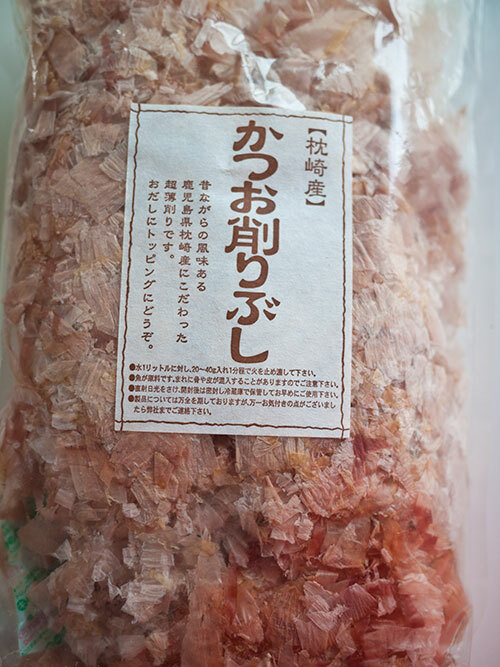 I'm definitely going to try the katsuobushi soaking instead to see if this changes the flavour in some way. I'm also confused about this. I have been told one must slowly bring the konbu to near boiling, take off the heat then chuck in ice cubes/very cold water to stop the boiling then remove the konbu, else the dash is spoilt. So should I simmer the konbu or not? Good question, re: simmering the kombu. I've been inconsistent in this myself to be honest - in previous old posts, I've recommended taking the kombu out when the water gets to a boil. However, I have discovered - as have others - that a bit of simmering adds more flavor, and even a subtle sweetness, to the dashi. The NHK popular science program Tameshite Gatten! (Try it out, and get it!) did some tests with this and they came to that conclusion also. For kombu-only dashi in particular I was kind of shocked at the 30 minute simmer time, but it turns out it produces a really delicous and intense kombu dashi. Try it out and see what you think! I've been using the method described in the "Dashi and Umami" book for a wee while, and also following youtube videos. I have dashi t-bag style stuff (with no added MSG) - would you recommend simmering one for a while? 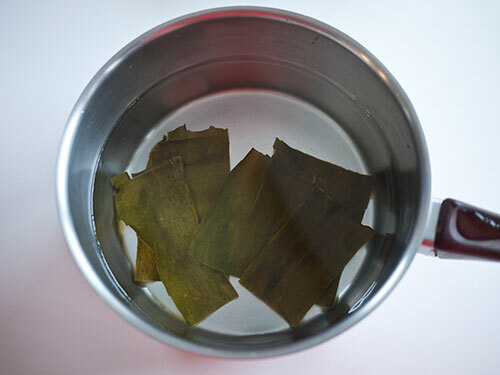 The dashi teabags can be simmered for a few minutes. They mostly seem to contain katsuobushi or niboshi or iriko (another kind of dried fish) though so those flavors will become more prominent over the kombu, the longer you simmer them. It depends a bit on the brand though - try out different times and see what works best. Just start tasting as soon as you put it in, after a minute, etc. and stop when it tastes just right. Great explanation. Thank you. I have been trying to incorporate more Japanese cooking into my family's daily life because it is just so good for us - as well as tasting great of course! This will help no end as homestyle cooking is what I'm aiming for ...and it's difficult to learn that without growing up in a Japanese home! I'm excited! I've read some articles dissuading from consuming MSG since it's bad to our health. On the other hand, I see it's a common ingredient in the Asian cuisine. Can I omit it while cooking? I hope it isn't necessary. MSG basically a concentrated form of glutamate. Because it's so concentrated, it's very easy to overuse it. I used to be just about dead set against MSG, but I've softened my stance a bit; in very limited amounts it can enhance flavors. But it's certainly not a necessity, especially if you can get that umami from other ingredients like dashi or stock, or miso and so forth. Thank you so much for your lesson! I miss this food so much, but the dashi always tasted wrong when I tried. So excited to use your recipe this weekend. Thank you for having this series. I've always loved Japanese food. I can't wait to be able to make some real authentic Japanese dishes at home! BTW, regarding soaking the konbu and directly boil the soaking liquid, does the soaking liquid become a bit slimy after soaking the konbu for 30 minutes? When I use konbu in Chinese cooking, I also soak them. Sometimes I soaked them for a few hours (before I went to work and wanted to use when I come home). I noticed the liquid thickened a little bit (has a gelatin feel, still in liquid form, but a bit shiny and slimy when stirred). Is this normal, or is it because I soaked the konbu for too long? Or, could it be the kind of konbu I got was incorrect? If it's slimy like I described, can I still proceed and boil the liquid to make dashi? Thank you. 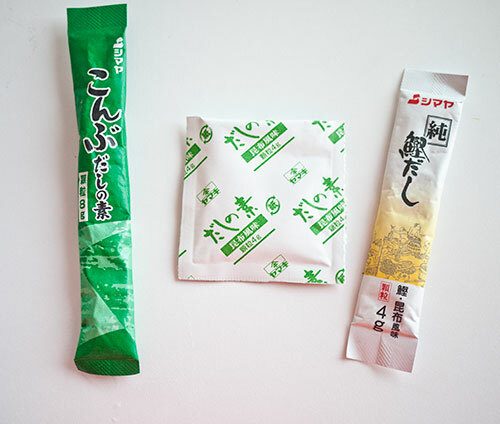 I like the sachets that are in the last photo, from Shimaya, especially the ones marked 'tennnen' or 'natural'. it's more expensive than the bog standard Ajinomonoto Hon-Dashi, but I think it tastes better. Maki, I love you! You're my favourite food blogger and it's so incredibly generous of you to be running this series. I agree 100% with your comment. I have also learn a lot about the Japanese culture and the language through your posts and news letter. Thank you Maki, for not only sharing your knowledge of food & cooking but for sharing the whole package! I have a question about the vegan kombu-only dashi. So, with this dashi you just omit the katsuobushi. Do we then need to add additional kombu to make up for the lack of katsuobushi? Not really - it's the longer cooking time that will extract more flavor from the kombu. You can add more if you like of course. With these natural ingredients it's almost impossible to go overboard. 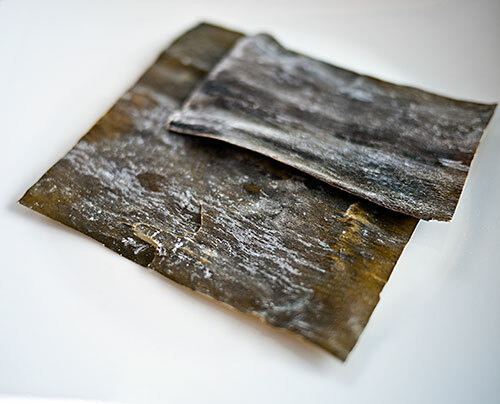 1 - Make kombu dashi with one big bit of kombu but quarter it. As a seasoning/stock, it's brilliant. For western-style soups, risottos, etc. 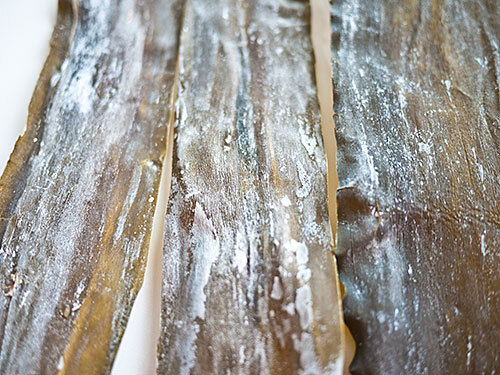 How long or well does Kombu and Katsuobushi keep after it's been opened? I don't often get a chance to make and use stock (though as this series goes on that might change) so I'd hate to waste the ingredients and I can't make a bulk batch to freeze. If you keep to keep it very well sealed, it will last for a year at least, although Japanese books and so on recommend using it up within 3 months for katsuobushi and 6 months for kombu. One solution is to divide your packets up into manageable lots, and seal each lot (say, what you'd use in a month or so), and store the rest double-triple packaged, in a cool, dark place. Thank you so much for your clear and thorough presentation! Very helpful! I would post a picture, but I was forced to instantly turn it into miso soup. Which was then consumed before I could take a picture. Teehee. And then we made mini onigiri (thank you!! we used to get them at Nijiya, but then moved to another state). Espresso cups make adorable tiny ones. 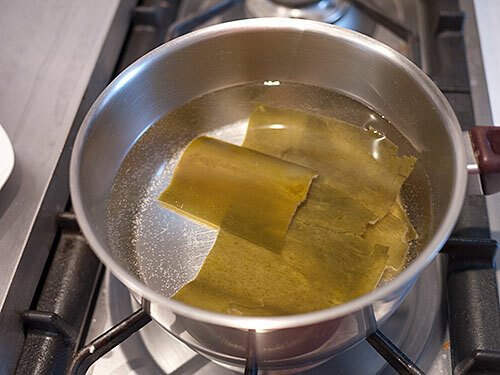 Thanks so much for clearing up the "wipe, don't wipe" topic of kombu. I also always read about wiping it off, but also read the advice about leaving the white powder as it had good flavor. I always ended up not wiping figuring I'd take off the good flavor powder. I figured, well I'm simmering it so that should take care of germs and I'll be straining it so that would take care of grit. But... I always felt funny not wiping the kombu. Thanks for clearing that up! Great recipe and good, clear instructions. Kudos! I was able to get kombu and wakame but no bonito flakeas (although found some dashi packets). The kombu was super gritty-- many pieces of grey coarse sand! I accidentally soaked two pieces, not realizing they were stuck together. But they separated soon enough to put the second one aside for the next batch. 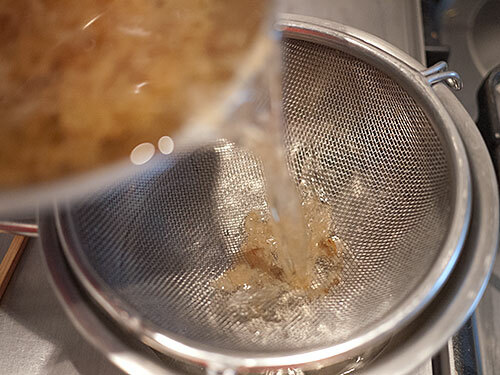 I *just* did this homework last night and it made such an awesome dashi! My partner--who generally doesn't bother with dashi-based soups--ate his entire helping! Just joined in, and after getting my supplied today, I'm in the middle of making my dashi. I weighed out 15 grams of kombu, and now that it's been soaking for 30 minutes, dimension measurement wise, it's about 3 times the size of the 1 1/2 - 4" squares! Is that right? I'm weighing out my katsuobushi now, and I couldn't fit 15 grams in three handfuls! It's all fluffy, and even squeezing it down, I'd have a hard time fitting it in my hand. I feel like I'm not understanding something here. I think I'm only going to put 5 grams of katsuobushi in, because that is about all I could fit in my hand if I tried to grab it from the bag. Maybe mine is just 'fluffier' than the kind you use? 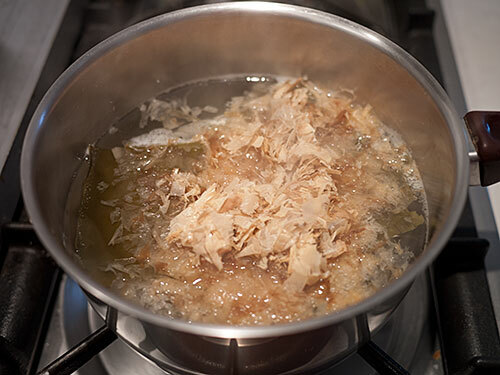 Before you started these wonderful japanese cooking lessons I had mistakenly bought the bonito flakes in the tiny packets with the intention of making dashi but never got around to it. Can I still make dashi with the little packets (the total amount for all 6 packets would be about 18g)? Can i use (first or second) dashi liquid to cook rice (instead of water)? 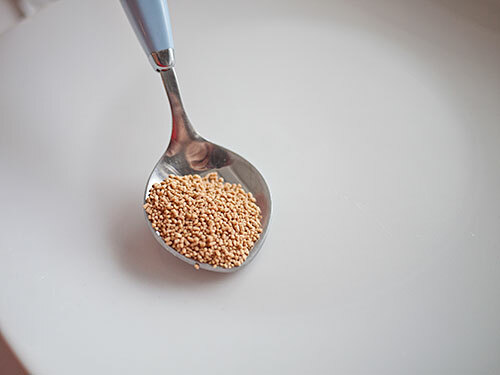 Have you tried holy basil seeds? several benefits - one of them being controlling diabetes. 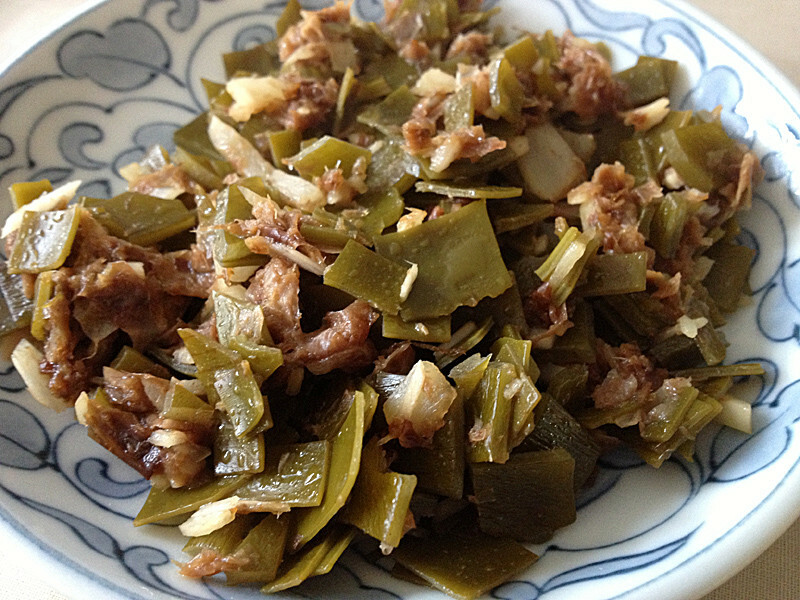 Sure, you can use dashi to cook rice. I love your site, and living in Japan it's helped me a lot in the kitchen. Since reading this dashi article I haven't bought pre-made dashi once, so thank you. It was very tasty. Next time I'll use sesame oil instead of vegetable oil and see what happens. Some hulled, white sesame seeds on top might be nice too. Just made this dashi from scratch and turned it into a miso soup. Fantastic! Now I know how it SHOULD taste if I make it at home, I feel more brave about experimenting with natural dashi stock "teabags" and the like. Previously, I vaguely recall there being a link to show how we can use the kombu that's been used to make ichiban dashi, as an ingredient for a dish. 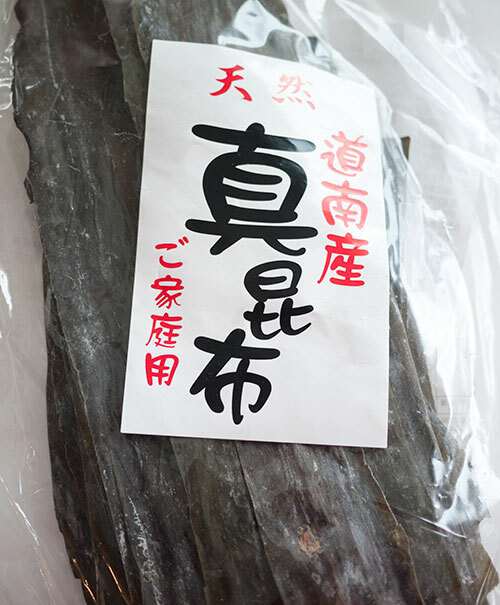 I've been been doing a lot of cooking lately with Dashi, and now have quite a big stack of kombu in my freezer, and am wondering what to do with it, if I don't want to use it for niban dashi. but a long time ago, after reading this page, I had ran out and found some dried kombu and katsuoboshi. However, I must have lost all confidence in cooking right after that, as they have been untouched since then. 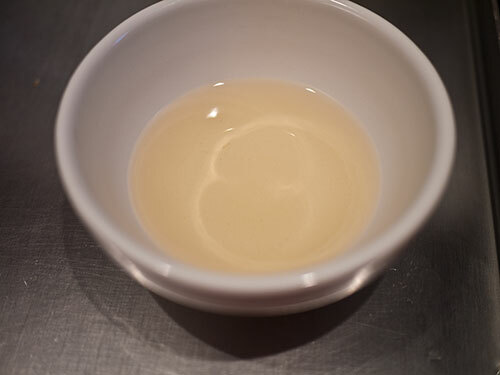 I would love to make more authentic Japanese and make my own dashi... I have such a severe allergy to any form of seaweed... I end up using chicken, beef or veggie broth depending on the dish! I was actually just about to post a reply similar to this and then saw this post. I am very allergic to seafood of any kind and that includes (most) seaweeds. I'm okay eating wakame and some sushi seaweeds (but not all - haven't figured out the difference yet), but I'm afraid of putting dashi in my food just in case. Is there a good substitute for dashi or can it be omitted from recipes altogether without totally ruining the dish? Thank u for your lessons! I have horrible IBS and was told by my doctor to try a cleaner diet. Your recipes and lessons are awesome and I have had almost a month without an attack... And have put some weight back on.Miso for breakfast! 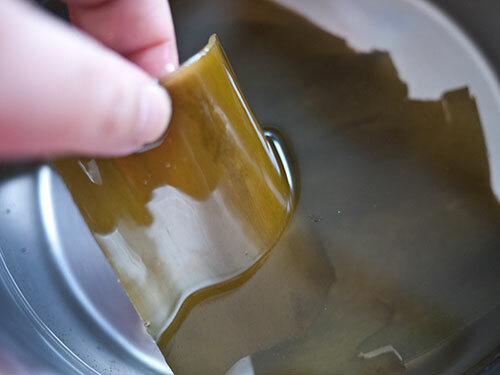 Is there anything I can substitute kombu with to make dashi? I can't seem to find an answer anywhere. Wow...that is absolutely ridiculous to ban konbu. 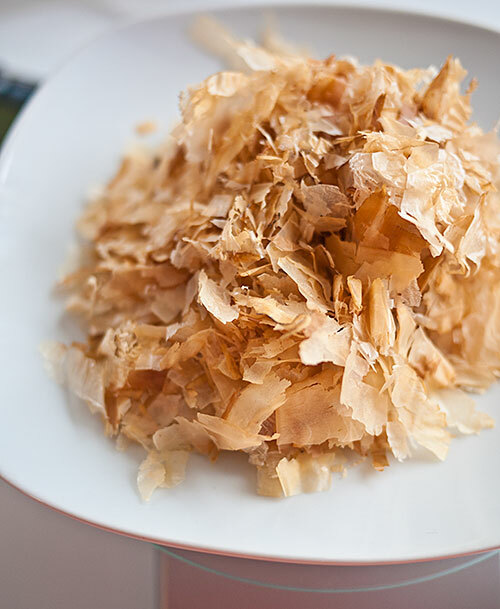 If you can't get konbu I'm afraid you will have to make dashi from just bonito flakes (katsuobushi). Or you could use dried shiitake mushrooms, although it will taste very different. I love sushi and ,miso soup, I've been making sushi for a while but I'm going to attemp making miso for the first time. I bought the individual packet granuels as it's hard to get fresh ingredients in South Australia. My question is how much water do I use for on 8 gramm sachet? How many ml of water can 1 small packet of 8 grams of granulated dashi be dissolved into to make dashi stock? You have mentioned several ingredients used for dashi, but only delve into the konbu/katsuobushi combination. Are there more combinations? Konbu/iwashi? Konbu/shiitake? etc. etc? I also feel like I've heard of dried squid being used, but I might be imagining that. Anyway, have you heard about any other ingredient combos for dashi? This article is exactly what I needed! I'm making a meal this week which requires dashi stock and after heading to our local Chinese cash and carry I was unable to find any of the granules. 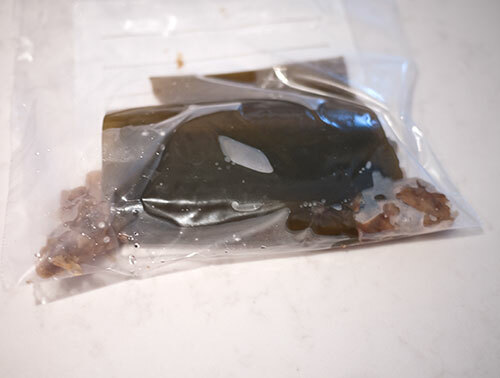 I did a quick search on my phone and found this article - turned out they had kombu and katsuobushi so now I can make a more authentic meal thanks to you!